As I alighted from the train at Bristol Temple Meads station on Saturday, I worked out that it had been 25 years since I had last set foot in the city. Whilst it’s a fine place, and not without its allurements, I have never really warmed to Bristol. I was born in Bath, so there might be a hint of snobbery in my chilliness towards my home town’s bigger, less refined neighbour. 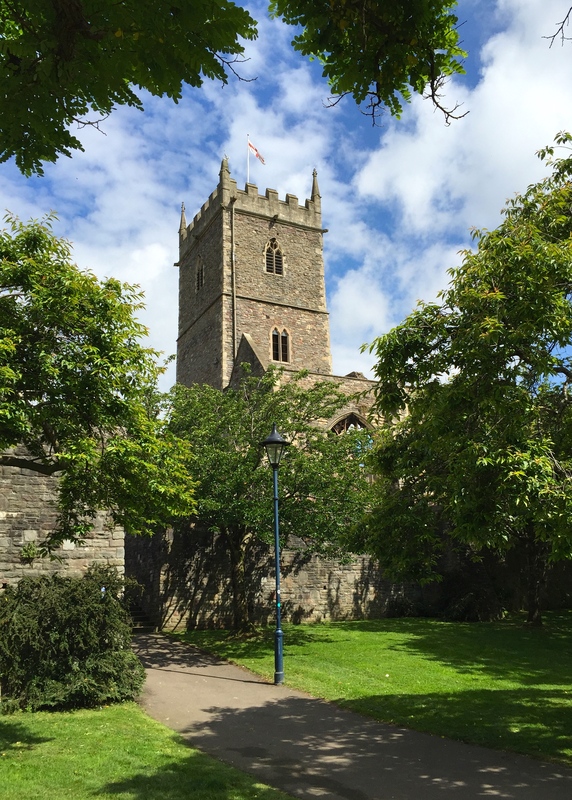 Returning to celebrate a 21st birthday (alas not my own), it took at little while for me to find my bearings – apart from the inevitable gentrification and burgeoning cafe culture, I found Bristol largely unchanged. Extensively damaged during the Blitz of November 1940, the city’s eclectic architecture bears the scars of WWII, both in the pock-marked fabric of the buildings that predate the bombing and the ugly modern development that followed. The gutted frame of St Peter’s Church in Castle Park always made me feel particularly sad and uneasy as a child, frequented as it was by the less savoury elements of society. 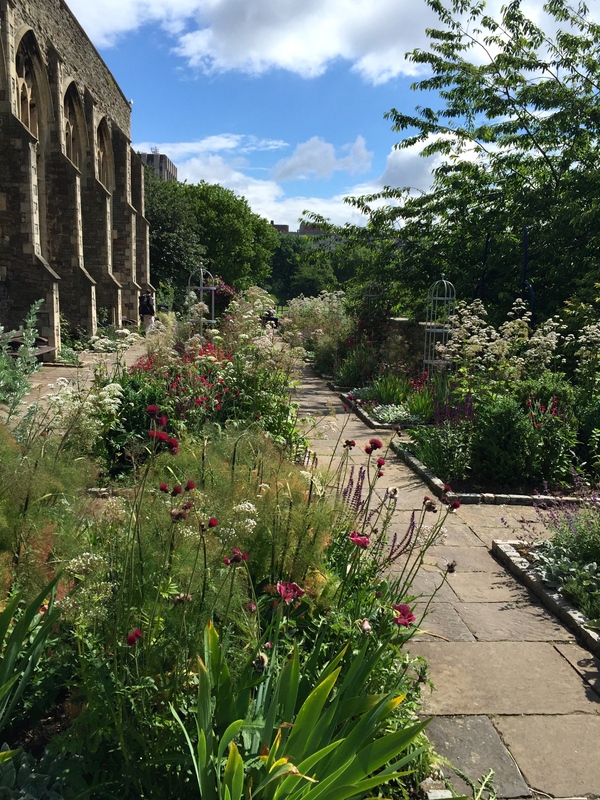 Now, parallel to St Peter’s ruined nave, fragrance company Jo Malone London has supported homeless charity St Mungo’s in creating the Castle Park Physic Garden. 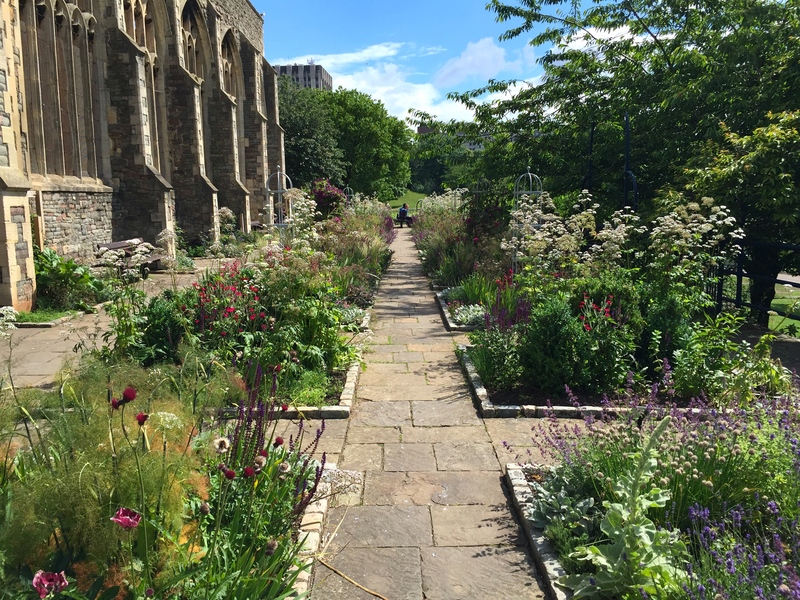 The garden opened in June 2015, replacing a sensory garden that had become neglected. Given my previous misgivings about the place it was a lovely surprise to stumble over such a pretty, airy display of herbs and flowers. The story behind the garden is even more refreshing. St Mungo’s works to end homelessness and help people recover from the issues that create homelessness, often related to mental ill-health. Each night the charity provides housing and support for 2,500 people. 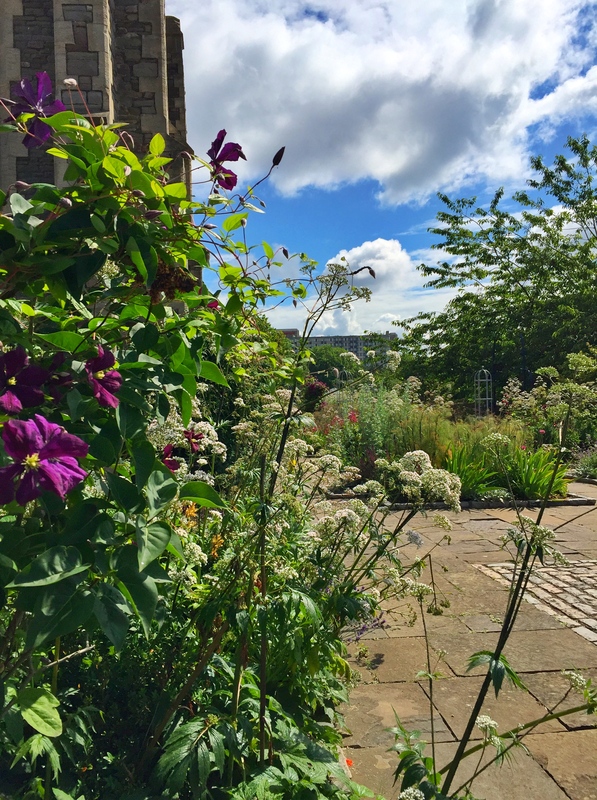 The Castle Park Physic Garden is a place where trainees on the charity’s “Putting Down Roots” programme learn practical horticultural skills, get the chance to function as part of a lively community and enjoy some respite from their troubles. There’s an opportunity to gain new qualifications in horticulture, paving the path to long-term employment. Since the garden opened there have been 1,500 gardening hours on site and more than 400 guided learning hours leading towards recognised accreditation. Thirty one trainees have participated in the project, five have completed a horticultural qualification and three have gone into full-time employment, including one as a landscape gardener. The garden flourished in its first year, work continuing through the autumn and winter with thousands of daffodils, bluebells and snowdrops being planted. The Putting Down Roots team keep the beds weeded, the shrubs pruned and the site generally clean and tidy. On occasion the Jo Malone London team come and help with planting under the guiding hand of designer Emma Coleman. Funding for the Physic Garden and five others across the UK helping people with mental health issues comes from the sale of a special Peony and Moss scented candle created by Jo Malone London. 75% of the retail price of £44 goes towards the upkeep and planting of the different sites. At a time when an “every man for himself” ethos seems to be gaining ground it’s great to witness the partnership between a large commercial organisation (Jo Malone has been part of the Estée Lauder group since 1999) and a charity working to combat homelessness and create a nicer environment for everyone. 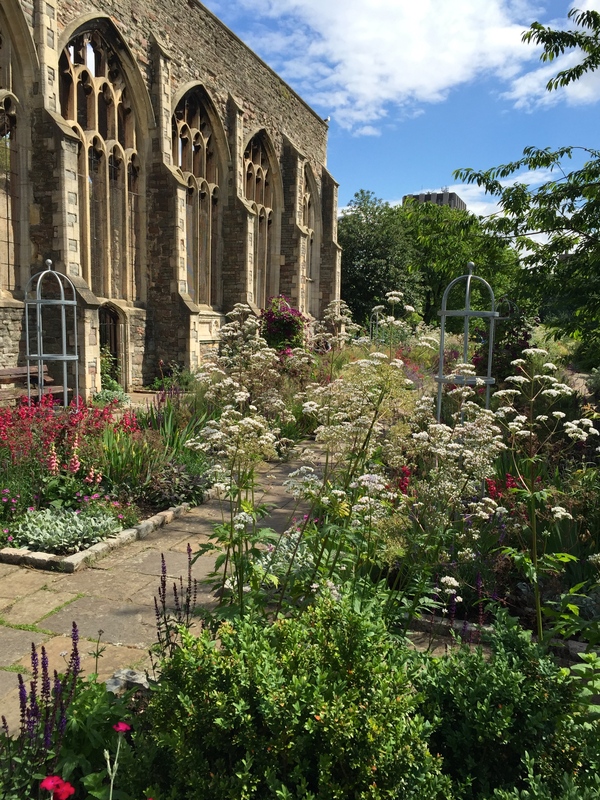 Beautifully presented, lovingly maintained and contributing significantly to the amenity of a busy urban area, the Castle Park Physic Garden is living proof that if you create an attractive environment people will respect and cherish it. Further collaborations of this kind could serve to enliven other lacklustre public spaces and introduce those less fortunate than ourselves to a rewarding career in horticulture. n Bristol. As one of the UK’s leading homeless charities Trainee gardeners are moving on to the next phases of their horticultural qualifications. Thank you I tried to puta comment up under the older post and couldn’t. I learnt more thank you. And thank Dr. Sloane for chocolate. My favo winter plan t has to be the snowdrop (though it is more a spring plant). 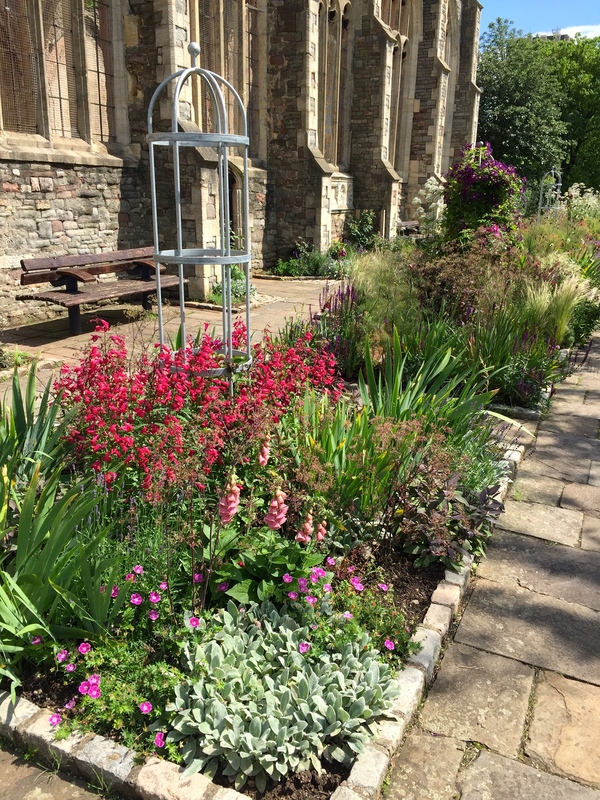 What a lovely tranquil place and such a great initiative…long may it continue to help out those excluded and to help to turn their lives around. A warm heartening post Dan In these last few troubled dark days since the referendum…a ray of hope..
We need a few more warming rays, both in the garden and in the news. Both gardens are absolutely sodden! Yes, a much-needed reminder, despite recent folly, that life goes on, in the garden, as well as in people’s efforts to improve the world, I do wish you and your fellow citizens the best as you sort through this mess. I love a good news story and this is one of the best kind. Thanks Dan. It really does help to counter all the negative reports that are constantly presented to us by the media. Indeed. Personally I am happy Wimbledon is underway so I can be distracted by that rather than 24 hour a day Brexit coverage. If Andy Murray wins the men’s I imagine he’ll have something to say on the matter though!! The healing power of sports! What a beautiful garden and Ps I do wear Jo Malone’s perfume!! What an interesting post, especially for me as I live within yodelling distance of Bristol and have strong family ties to the city. Even so I have missed some of these high lights. Thank you! Yodelling distance – on what scale is that measured? The Tarzan scale? I’ve only been to Bristol once and from the little I remember it was certainly less spectacular than Bath. Anyway, everywhere could do with more of the collaboration you mention. We are fortunate in my village that RHS Britain in Bloom has galvanised the community with local business support to beautify neglected spots. That’s good to hear Helen. Bristol has many highlights and some lovely parts. I’d definitely like to go back again to explore properly, and I have never been to the zoo, which is criminal. Bath benefits from being largely constructed during the Georgian period, from one type of stone, which lends it cohesion as well as grandeur. I imagine Bristol would have felt much more unified and attractive prior to WWII. Yes, shame about the bombing. You are much better placed to comment on Bristol than me Gill! You are right, West Country people are in a class of their own and this is what makes it a special place. Another honorary Bristolian here. Thank you for telling us about this beautiful garden. To my shame I had no idea it was there. Castle Park is not an area on my daily round and, like you, I have always thought of it as not a place to linger but this scheme has really transformed the place by the look of it. Hi Ceri. 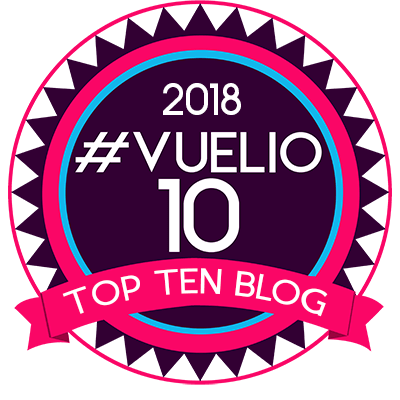 I live in London and the amount of things I don’t do or see would take a lifetime of blogging to cover, so don’t worry. In this case visibility is not helped by the garden being on a high terrace on the harbour side of the church and therefore hidden from the road and also from the waterside. Hope you get a chance to go and have a look whilst the garden is still looking so summery. Wow! Praise indeed Judy, thank you. I was very impressed with the maintenance of this garden as well as the lovely juxtaposition between grey stone and soft, fluffy pinks and whites in the planting. It certainly sounds like a brilliant scheme. Just a pity the amount of proper horticulture in our urban parks has dwindled so much, creating fewer jobs for gardeners. It’s all private work these days. What a gorgeous garden, gorgeous photos and a lovely story. As you say, such a relief to hear something positive at the moment! Gardening really can work wonders in so many ways. Well thank you Janna. To tell the truth I had less than 2 minutes to take those pictures as we were on a “family walk” and no one else was remotely interested. Alex did at least hang back and wait whilst the others marched on! We definitely need to get Alex and Paul together. It’s clear Paul needs some (more) coaching! Ditto on all the supportive comments above! In reading the name “St. Mungo’s” I suddenly had a flash of Harry Potter . . . have to pull out my HP books and look that up. 😆 I had to look it up too as I hadn’t appreciated the Harry Potter connection. shouty preachers. On the whole the garden is blissfully tucked away from the saddening but maddening refrain, every few yards, of : ‘Can you spare me some change? although some individuals’ noise pollution is now overspilling into Castle Park itself. But The Physic Garden itself is a magic world, hidden away from the lunchtime hordes and the annoyance of being beseiged by cyclists unexpectedly coming at you from all directionss; whizzing on and off the pavements diagonally, disregarding even red lights and ignoring of that former, more courteous highway code of dismounting to wheel a bike through a pedestrian crossing. The Physic Garden just feels like a haven, away fromit all the and from seeing the robot-like people, listening to their headphones, or talking too loudly to beat the traffic noise, seemingly endlessly, on their mobile ‘phones, speaking right into your ear, oblivious to your proximity, denying your very existence. The Physic Garden is such a welcome refuge from all this . Its beauty has even inspired me to be more experimental in my own plantung and to choose taller, more structural and bee- friendly flowering plants, alliums, verbena and dark cerise penstemons for some of the beds in my own urban cottage garden. Thank you to all who tend it and to Jo Malone, who support it. Here, here (he said quietly)! Tall plants, provided they are narrow and / or ‘transparent’ have an important place in the garden, even at the front of a border and especially towards the end of the year when the garden can be allowed to get a little fuzzy around the edges. I especially enjoy fennel and the more diaphanous grasses. I am afraid I never warmed to Bristol City Centre when I was younger. I found it very dislocated and difficult to navigate. I know it’s extremely trendy now but I was always more drawn to Bath, which has it’s own busyness issues!